Andi tuned and saw a woman walking toward her. She was of average height, with long dark red hair that flowed half-way down her back. She wore jeans and clogs, with an ivory cable-knit sweater that just grazed her hips. Her face was more interesting than pretty, Andi thought as she approached. High cheekbones and large green eyes. Her pale skin was probably a result of both genetics and a complete lack of sun exposure since the previous September. They shook hands. Weak sunlight broke through the clouds and highlighted what looked like a dark purple streak in Boston’s hair. Andi fingered her own dark hair and wondered if she should do something as dramatic. The most she’d ever managed was a trim. I loved this book!! Having moved into a new community within the last year, I know how important it is to form friendships with your neighbors. I have met some wonderful women in my neighborhood and have become re-acquainted with my cousin. It’s almost like we are sisters!! This was an easy read and very enjoyable. It made me laugh and cry. A great read!! The characters all came to life for me and I could relate to each of them in one way or another. The “Three Sisters” mentioned is really the three historic houses on the block. However the three owners eventually become best friends. Andi was left at the altar and has some commitment issues and decided to leave her home town and buy an old house that desperately needs repair and may find love along the way. Deanna does everything to be the perfect wife and mother, but finds out her family does not think she is so perfect. She wants to change but doesn’t know how. Boston lost her six month old son and she and her husband are finding it hard to grieve and may lose each other in the process. The three women find they can help each other through their troubles and find that they can be great friends too. Susan Mallery is a New York Times and USA Today best-selling author who has entertained millions of readers with her witty and emotional stories about women and the relationships that define their lives. She has published more than 100 romance and women’s fiction novels beginning with two books the same month when she was just out of college. Susan has a Bachelor’s degree in Accounting, and went on to get a Master’s in Writing Popular Fiction and has extensively studied story structure in screenwriting courses. Her goal, always, is to give readers a story that will move them, populated with characters who feel like real people. Born and raised in California, Susan now lives with her family in Seattle, where she survives the dreary days of winter with the help of a “happy lamp” and plenty of coffee. I received this book for review. Opinions are my own. Sounds like a perfect summer read! I’ll add it to my list! Thanks! I wish I had more time to read. Sounds like a nice, easy read. I’ve never read any of her books before. I’ll have to check this one out! Sounds like a good beach read. There is nothing like a good book to read. This sounds like the perfect read! 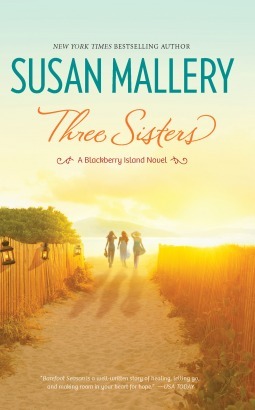 Thanks so much for taking the time to read and review THREE SISTERS! I’m so glad you enjoyed it. It means a lot to me t o hear from readers who were moved by my story. I’ve asked my assistant to post a link to your review on the Reviews page of my website. Thanks again! I wish I had time to read. Sounds like a great read. Sounds like a great book. I love the cover. Agree, friendships are important and a sister-like relationship can be so fulfilling! I was reading steady for a while but it has now been a while since I picked up a good book.